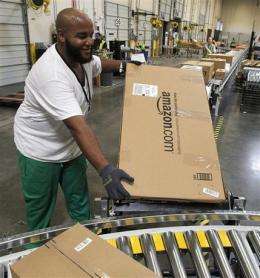 (AP) -- Amazon.com Inc. said Tuesday that its second-quarter profit fell despite a 51 percent jump in revenue as the leading online retailer spent heavily to expand its business. The results easily beat analyst expectations, as did Amazon's third-quarter sales outlook. Its shares rose 6 percent in after-hours trading. CEO Jeff Bezos attributed the sales growth to "low prices, expanding selection and innovation." The growth means Amazon must keep investing in operations expansions and upgrades. So far this year, it has announced it is building 15 new order-filling centers. In a conference call with reporters, Tom Szkutak, Amazon's chief financial officer, said he expects that figure to rise. Overall, operating expenses rose 54 percent to $9.71 billion. For the second quarter in a row, this cut into its bottom line. The Seattle-based company earned $191 million, or 41 cents per share, compared with $207 million, or 45 cents per share, in the year-ago quarter. Revenue rose to $9.91 billion from $6.57 billion last year. Amazon's electronics and general merchandise revenue rose 69 percent to $5.89 billion, while sales of books, CDs, DVDs and other media rose 27 percent to $3.66 billion. For the current quarter, Amazon forecast revenue of $10.3 billion to $11.1 billion, the midpoint of which is above the $10.40 billion analysts have been hoping for. As usual, Amazon did say how many of its Kindle e-readers it sold in the quarter, only indicating that Kindle sales rose when compared with the first three months of the year. During the second quarter, Amazon said it was selling more e-books that it offers for the Kindle than the hardcover and paperback books it carries. Bezos said the $139 Kindle 3G with Special Offers - a version of the Kindle released during the quarter that is subsidized with ads - is now its top-selling Kindle device. Speculation is swirling that Amazon may be working on a tablet device to rival Apple Inc.'s popular iPad, but Szkutak would not divulge any details. Many e-readers like the Kindle use screens with "electronic ink" technology that makes them best suited for reading, especially in bright light. Tablets such as the iPad have backlit screens and are intended for functions that go beyond reading text, including surfing the Web, video chatting and watching movies. "We have a longstanding practice of not talking about what we might or might not do in the future, so you'll have to stay tuned," Szkutak said. The company also did not give an update on its ongoing battles with states that want online retailers to collect sales taxes on purchases made by their residents. Amazon shares rose $13.02, or 6.1 percent, to $227.05 in extended trading. The stock finished regular trading up 69 cents at $214.18.